Another crackdown on illegal street vendors. No, the streets are not illegal, though some of them should be; it's the merchandise: mountains of leather goods, watches, and articles of clothing with counterfeit labels such as "Gucci," "Versace," "Cartier"—all of it swept up in a giant raid by members of the Guardia di Finanza the other day. The vendors, all "extracomunitari" (usually meaning illegal migrants from Africa) usually manage to gather up their stuff and scurry off into the alleys of the Spanish Quarters, but this time the dragnet was effective. There was a lot of stuff confiscated, some resistance and maybe a few persons taken into custody, and in the mad scramble, a Korean tourist stupid enough to walk around Naples with a real Rolex on his wrist had it ripped off by two punks on a motorcycle. The feast day of Santa Patrizia (St. Patricia) is on August 25. Certainly less well-known than San Gennaro, the patron saint of Naples, Santa Patrizia is a sort of co-patron. She is also known as St. Patricia of Constantinople after the place of her birth in the 7th century. She went to Rome to escape a planned marriage and then embarked on a trip to Jerusalem but was shipwrecked in Naples. She founded a convent there; she has been the object of fervent veneration due to the feature she shares with San Gennaro, that of the miraculous liquefaction of a vial of her blood, believed to occur on her feast day at the site where her relics are entombed, the church of San Gregorio Armeno. The paper reports that, according to the faithful, the event occurred on schedule. Somma Vesuviana is a town on the northern slope of Mt. Vesuvius. 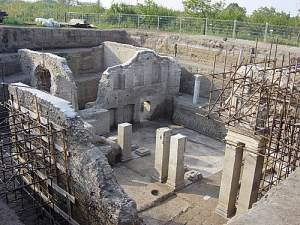 The claim is now made that ruins (photo, right, by Michelem) uncovered there are the imperial Roman villa of Caesar Augustus and, in fact, his last abode, the place he died. The ruins were partially uncovered as long ago as 1930, but WWII and other priorities of subsequent decades intervened until about eight years ago when excavation of the site was given to a team from the university of Tokyo. So far, about 1,800 sq. meters of the site have been excavated from as deep as 10 meters below the surface; much of the excavated material is lava flow from eruptions over the last 2,000 years. Father Antonio Rungi of Mondragone insists that he has been grossly misunderstood! His campaign, promoted on a website he put up, to find "Sister Italia 2008," the best-looking nun in Italy was intended to explain life in a modern convent to the public; it was certainly not meant as a "Miss Suora" contest as the vulgar local press has called it. His site says that "they won't have to parade up and down"; they just have to send in a photo that says something from an expressive, spiritual and aesthetic point of view." Whatever, he can forget it. The spiritual beauty contest has been cancelled and whatever rumors you may have heard about two-nun beach volleyball are unfounded. Security cameras. The pedestrian promenade and other streets in the Vomero section of Naples can be risky places to stroll around, depending on the time of day. Shops, as well, run a certain risk of being held up; many, in fact, "buzz you in" only after looking you over through the window from the inside. The city decided to big-brother up to the challenge and hired a company called Digital Architect to install and maintain video surveillance equipment at 65 crucial points. Installation was fine. The gear is in place. Digital Archive has since gone belly up, and the equipment has never been turned on. Giuseppe Ferrigno has died at the age of 73. He was the best-known of modern figurari, those who craft small figures to be placed in the "presepe," the Christmas manger display. Most tourists who visit Naples sooner or later wind up on via San Gregorio Armeno and stopping in front of his stop to admire and have a chuckle at his specialty (photo, right)—figures of modern politicans or sports stars such as Berlusconi and Maradona, for example. You buy them and—depending on your mood—put them next to the Christ Child or out back with the donkeys, I suppose. Neo-Realism and Neo-Melodicism have overlapped in what is currently the most played song on local Neapolitan radio stations, A forza mia si tu (You are my strength). It is sung by Franco Calone, a gentleman hailed as one of the champions of "Neo-Melody." That's fine. He has a lovely voice. What is causing a stink, however, is that the song contains such lines as "I know the law says I was wrong, but I don't mind being in prison" and was written by Aldo Gionta, a convicted member of organized crime and currently in prison. Authorities don't like it when outlaws are romanticized. Like it or not, it is part of a very long tradition.